Breath of the Wild! Ghost Blade HD! SEGA discounts galore! More! Another week dawns and just so happens to include the launch of the Nintendo Switch. The Nintendo Download Update details for Europe, however, focus on the Wii U and 3DS treats to come, which happen to include the highest profile launch title for the new system. Beyond that obvious contender there are a few other interesting arrivals, along with a whole load of discounts on Wii U and 3DS - let's get to it. 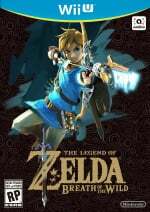 The Legend of Zelda: Breath of the Wild (Nintendo, €69.99 / £59.99) - The boldest entry in the series to date, this takes the core ethos of the IP and blends it into a systems-based open-world adventure. It's quite unlike any of Link's adventures before now, and we've been very impressed by Nintendo's achievement with this one. You can read our preview of the Switch version here, while our review will go live right on the pre-release embargo; we do intend to also obtain a copy of this Wii U iteration to provide some comparisons and details as soon as possible. Available from 3rd March. Ghost Blade HD (2Dream, €8.99 / £8.09) - The latest modern spin on the iconic shoot 'em up genre, with this one promising bullet hell to bring back fond memories of the '90s while also supporting multiplayer. Brave Dungeon (INSIDE SYSTEM, €4.99 / £4.49) - The 3DS is jam-packed with retro-styled RPG experiences, and this looks like another to be making its way out of Japan. The story sounds a little typical - explore labyrinths to find 'powerful Magic Items' - but that won't necessarily detract from the game, which looks relatively well produced in publicity footage. Parascientific Escape: Gear Detective (CIRCLE Entertainment, €5.00 / £4.79) - A follow-up to a bit of a surprise gem from 2016, this seems likely to also incorporate a blend of escape room-style gameplay with a sense of adventure. Your character, Detective Kyosuke Ayana, has the ability to look back in time, but we'll focus on the present and work on a review. Nothing for me. On 3DS or Wii U that is. £70 for Zelda? I'll wait thanks. Nothing. I'll be spending all of my money on Switch, accessories and games. I'm not downloading anything. I will buy Zelda at retail, though. "We do intend to also obtain a copy of this Wii U iteration"
Does that mean Nintendo hasn't even sent out review copies of the Wii U version? @riChchestM It's £60. I think you might have been looking at the Euro price. Still a rip-off, though. It's all about Zelda. Can't wait. I'm buying the Wii U retail version. Don't you know? The digital price of €70 is a disgrace. I paid €40. What about the Switch line up? I need that World of Goo confirmation! the download version of Project Mirai is super tempting at that price... and means I don't have to carry the cartridge with me at all times anymore, so... that's a no brainer, even with spending a bunch of money on the Switch and its games this week. @SuperCharlie78 I suspect all those details will emerge tomorrow from the Nindie Showcase, which should be fun! So, Zelda does cost that much digitaly. It wasn't a placeholder price, as some hoped. Great opportunity to pick up some RCMADIAX games. @Moon "Awful opportunity to pick up some RCMADIAX trash." Fixed for you. You're welcome. @KTT I've emailed Nintendo to ask if it's possible to buy it digitally through Amazon US. It's $59.99 on there which converts to around £48. If it's possible then that might be the cheapest way to go. Or change Esop region to NA and purchase through there.Ive got a lot of US Amazon gift cards I've had for ages so if I can use then to purchase my games digitally I'll be a happy man. Hopefully I'll get a reply from them today. The only thing I'll be downloading this week is the day 1 update for Switch. Wow, looks like all SEGA 3D Classics are on offer at the same time (well except sonic for some reason), hmm time to pick up the ones i missed. Wow, 70 and another 20 for the full experience?! I remember when I paid 200 for my windwaker bundle! I'll get Breath of the Wild for the Wii U 00:01, March 3rd . I wanted the physical copy, but I would have to wait at least another week until the game arrived, and... yeah, no chance. I'll buy the physical version for the Switch later, when I get one. Probably at the end of the year. Still debating on my head for which I'll get the DLC. Forget everything on this list. It's time to Du-du-du-du- d-d-d-d-d-DUEL! - ImeanSwitch! @RainbowGazelle £79 if you include the expansion pass. And I do include it, if it's day 0 content. It's on the cart. Has anyone ever bought Fit Music for Wii U? @riChchestM Seeing as most of it doesn't come out until later, it might not be on the disc/cartridge, but I see your point. wow, now that's a nice Sega discount sale. Got to get the 3D classics I'm missing. 70€ for Zelda is insanity. It's already kind of too much that I'm paying 60€ for the disc version on Wii U. Is that a mistake on the price for Zelda BOTW download, surely it's not £60? They really don't want Wii U owners to buy it do they? I got disc version for £30 using Amazon £10 off code. I managed to preorder the Wii U version of Zelda for £40. I'll wait until we have more details before I decide upon the DLC. I'll be buying Zelda physically for WiiU at some point in the next couple of months, along with the (hopefully inevitable) Prima guide, to go with my Wind Waker HD and Twilight Leonard's HD ones. Interested to see how the reviews stack up comparing the WiiU & Switch versions, but I'm really more interested in playing it on the WiiU as a swansong for the console. When is Europe getting new Nintendo Selects like America?! I'll be getting the BotW Expansion pass for the Switch, but that's probably all for this week. @riChchestM The only thing you get 'day zero' as you call it, are a few chests. The extra content, the bulk of the pack, comes at a much later day. This was clear in the original announcement. The content is definitely not already on the cart. It got an EDGE 10. Everywhere else will follow suit. If you're not getting Zelda on Friday in some format then you're reading the wrong site. GHOST BLADE HD Woohoo! I'll be getting that for the WiiU and Zelda on the NS on Friday. Don't you mean RCMADIAX discounts galore? If you aren't getting Zelda this friday, then yous crazy! Physical LoZ all the way! My only complaint is that the game card isn't gold, especially with the series' history of gold carts, controllers, etc. Despite a pricey Switch buying spree, I'll still drop £8 squid approx for Ghostblade HD. Hope it makes it to the Switch soonish; although lack of and-pad will be annoying in portable mode. Oh and maybe a few Sega 3DS classics while I'm at it. ......just kidding. I'd rather eat out the rotten ! "#hole of a roadkilled skunk. Anyone who hasn't picked up Rhythm Thief should. Same with the Sega 3D Classics. @Mogster Unless you have inside knowledge you cannot say that the content is definitely not on the cart. Perhaps some of it is and perhaps some of it isn't. It's still day zero if you pay for it on day zero. And that still makes Nintendo's e-shop price £59.99 plus £19.99 for Wii U.
I'm certain it will be a great game, but only a maniac would pay that money for it. Are we really going to wait till launch day to get a official list of what'll be on the eShop day one? Kind of leaving it late for those picking up the system on day one and wondering how many eShop cards they should buy (If they don't or can't use a credit/debit card for the eShop). I suppose their "Nindies" event tomorrow might reveal it, but really leaving it late Nintendo. It's on the weekly download list... just got real. Holy quacamole.... 70€ for Zelda??! I hope that isn't the standard price for First Party "AAA" Switch games. No it's not $70 or £70 for Zelda. It's €70 and £60...still a lot, but read the damn currency signs people. Anyway, where's the Switch list of download titles? They making us wait even on that?! I'm cancelling my Switch pre-order. I mean, who needs it when I'll have sssooo many absolutely fabulous RCMADIAX games to sink my teeth into, darling. @Baker1000 There is an indie presentation tomorrow so I imagine all will be revealed then.Could mean there will be 1 or 2 day one surprises.We already know FAST RMX and Shovel Knight will be there and (I think) the Tomorrow Corporation trio and that there will be no VC.The Arcade Archive Neo Geo games are coming this month though starting with King of the Fighter 98.Since that wont be classed as a VC release,that might be available on Friday.Looking forward to tomorrows show. I was kind of hoping there would be cross-buy for Breath of the Wild on Wii U and Switch. I guess that is asking for too much. 60 squids for Zelda jeez! While this week is all about Nintendo Switch and Zelda, I'm also going to pick up Rage of the Gladiator. @Angelic_Lapras_King We'll know tomorrow via the Nindies event. Getting BotW and the expansion pass but haven't decided on the platform yet, likely Wii U but the Nindies event tomorrow may change things. Gonna hold off playing BotW till I get a Switch. @ThomasBW84 pretty disappointed in Nintendo not offering early download access for Wii U version of BotW. I get that it's all about Switch these days, but still. Glad to see the Wii U is going out strong with a RCMADIAX sale. Since I have no intention of buying a switch this year (maybe next year when it gets some more games and Mario Odyssey is out), I'll definitely be getting some 3DS discounts and games...as long as the Sega sale comes to the US too. Really, only 26% are going to buy BotW?! 38% chose 'nothing for me this week'? How can that be? @riChchestM Where does it say 70£? It's actually £59.99. And you can get it even cheaper at keyshops. I'll get my key for 56€, for example. HAHAHA £59.99 for a digital and the inferior version of The Legend of Zelda: Breath of the Wild is just ridiculous however im going to be picking up the rest of the Sega 3D classics that have never been on sale before and Hyperlight EX for 89p as the games at those prices are GREAT value. WOW ive just noticed that 26% of the gullible people are getting Zelda at that price. @Baker1000 Actually, it's only the Wii U version that costs 70€ officially. The Switch version costs only 60€ officially. Still, as I mentioned before, nobody has to actually pay 70€. E.g., with the voucher code "planetkey", the Wii U key costs only 56,25€ (instead of 58€) on mmoga. So that's exactly what I'm gonna pay for it. Does Sega Rule on 3DS or what? Thank you for being there at the right time Sega! I hope we see some more Sega Classic 3D games before its all over. I would love to see a few more Sega 3D Classics a couple that come to mind for me would be Mickeys Castle of Illusion, Shining in the Darkness and lastly........Virtua Racing. Thwy have so many more they could 3Dize its sick. Thanks for what you have done and thanks for what you will do in the future. Your games blew the socks off Virtual Console. Given that Nintendo are able to sell BOTW to 2 markets, Switch and Wii U. It wouldn't hurt them to offer the digital Wii U version at a lower price. They make Wii U owners wait years for a game so that it can be a Switch launch title and remove Gamepad functions. Then they have the audacity to charge £60 for the digital version, the most they've ever charged for a download! As a reward to loyal and patient Wii U owners, this is a disgrace. It's really soured my view of Nintendo. I wish the gaming press would question Nintendo about this, how on earth do they justify it? Awesome.. We won't get reviews of botw wiiu before they disappear from stores. I was hoping for the N64 Smash Bros. this week. I'll grab Zelda Breath of the Wild at some point, but I'm in no rush since I'm busy with other games. Hatsune Miku Project Mirai DX is very tempting with that discount. RCMADIAX has ruined me for gaming. Now all I can do is move right or left to avoid blocks. Anything more and I get all confused nowdays. I bought my 3DS last year so there's still plenty of space to fill my gaming library. If I get a chance I'll buy some of those 3D Sega titles. Out Run and a couple of the others as well. How can Nintendo justify charging £ 59.99 for the digital version of BOTW... That's utterly bonkers. Super kudos to Nintendo Life for taking the time to list all the discounts again, linked to each title! Zelda - can't believe it's upon us already!! "we do intend to also obtain a copy of this Wii U iteration to provide some comparisons"
Of course you will but not after you review the switch version which is probably part of your embargo. I fully expect the WiiU version to be exactly the same as the switch version. Which is what the review will confirm once they finish praising the switch version. Anyone wanna put money on that? Has anyone got a lend of 90euro? I need to download the latest Zelda. WHAT? Can somebody tell me where I can buy Zelda cheap? Seriously. These prices are absurd. @OGGamer @OGGamer anybody ever take you up on your internet bets?